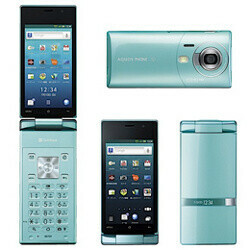 The Sharp AQUOS PHONE THE HYBRID 007SH is not only one of the most ludicrously named handsets out there, but the world’s first to come in with the combination of Android, a clamshell form factor and autostereoscopic 3D. We’ve seen some Android clamshells before, but it’s the first one where all of the features including 3D meet in a single package. The phone features a 3.4-inch 3D LCD autostereoscopic (no glasses required) touchscreen, which sounds spacious for a flip phone, and the screen doesn’t just flip, but it also swivels around transforming the AQUOS PHONE into a candy bar phone look alike. A small 0.7-inch additional OLED display is on the bottom as well. The impressive spec sheet continuous with a 16-megapixel CCD camera capable of recording HD video, but you’d be even more surprised to BluRay recorder connectivity, a digital TV tuner and a waterproof body. If you haven’t guessed it by now let us dispel any illusions - the device is slated for the open to experiments Japanese market. In addition, standard connectivity is also well covered with support for Wi-Fi b/g/n, GPS, an infrared port and a microSD slot. The handset weighs a rather average for a smartphone 4.94 ounces (140 g), while its thickness measures at the considerable 0.76” (19.3 mm) of girth. On the software side, you’re looking at Android 2.3 Gingerbread. Do you think that such a phone would spur interest stateside or is it doomed to failure? Give us your two cents in the comments below. Make it a dual core and that is too impressive of a spec sheet to pass up. Especially if it has a on screen keyboard. It would probably need a name change for stateside as well. Dear lord...check out the size of that Camera Sensor!!!! (Yoda) Amazing piece of hardware, this is!! I think the gawdy hardware around the camera lens is an illusion. The lens actually looks comparable to other smart phones. Also, realize the sensor is INSIDE the phone, not outside. This device may attract current flip phone owners as a stepping stone device to other smart phones. I actually know people that won't give up their physical button layout because they rock at T9 predictive texting. Wow, this actually solves a lot of my problems, if I ever plan of parting with my Galaxy S. For one thing, I've always been a huge fan of the clamshell form factor, and the only reason I'd moved on to a full touchscreen was because of its functionality. I'd been hoping that the Sony Ericsson S005 would get an international release, but I'll probably settle for this, if it gets a GSM version. Though the S005 still wins in the design department, in my opinion. Well I would get it if it came out with a carrier over here in the Us. I'm not gunna lie..I wud definitely get it I wudnt need to carry my digital camera everywhere I go so yea... But most likely we will never see it over here. the price will determine its success if sharp decide to sell it outside of japan. and also good ad campaign will help and good reviews form phone websites. but they have to start with the price. japanese goods are almost always more expensive than others. People knock texting of flip phones. But people are still using the old system and are doing it just fine. Some phones are a lot slower when texting. The end result is what's important. Like did the recipient get the text. That's what matters to me!! !